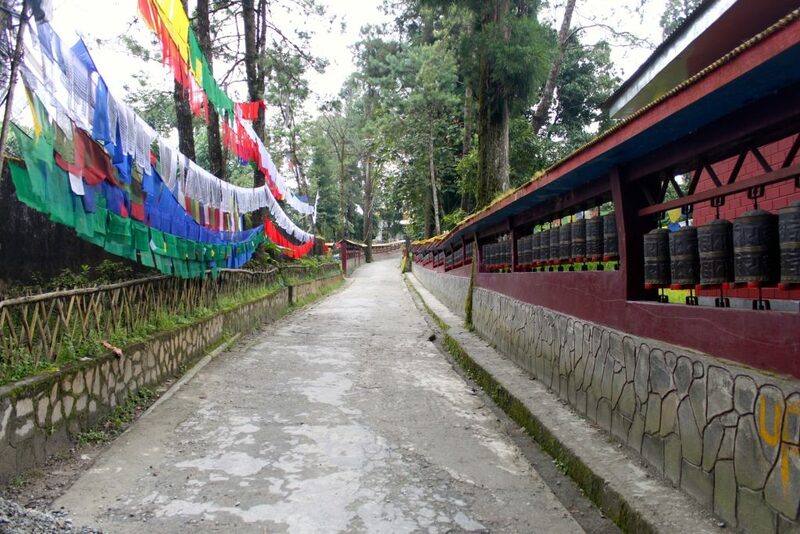 The bikers will love to enter this destination the state of Sikkim, which allows the visitor to get in touch with the colorful cultural heritage and monastic lifestyle of the Sikkimese people. Sikkim is one of best for mountain biking and adventure. The rugged and dramatic terrain of Sikkim Himalayas offers sure and exciting biking trails to the adventure lovers. The most of the roads are good and which are bad, because they’re constantly repairing damaged roads due to bad weather and landslides. 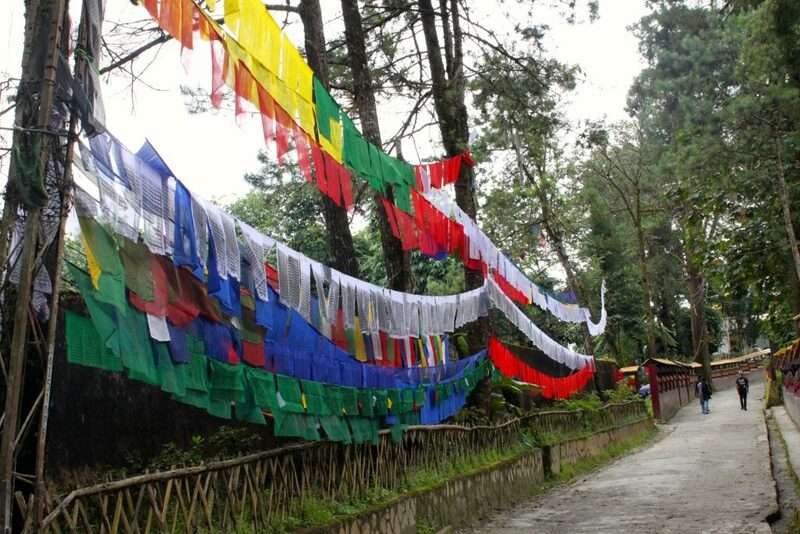 The beauty of the countryside, flora and fauna and lifestyle of the Sikkimese people is best experienced. 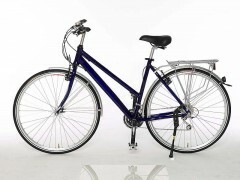 On a bike's seat you will roam through lush green hills and dales mostly in North Sikkim & West Sikkim. Daily cycling average distance between 30 to 40 kilometers each day. Instead of giving a certain number of kilometers each day, we mention total distances between the destinations and leave the choice of cycling distances to our guests, the supporting vehicle will always be there at your service. En-route we will have bottled water and juices after every 15 to 20 kms available in the supporting vehicle, which will always follow the cyclists. . If at any point riding seems a little hard, the supporting vehicle takes you for as long or as little as you wish it to. Average temperatures range from max of 20°C and minimum of 15°C. and pleasant, perfect for cycling. Please bring a sun hat, sun cream and sunglasses. The mornings and evenings are generally cool and mild, however, April and late October can be very cold. For detailed travel kit recommendations and any more information please refer to our FAQ section. You will be acknowledged and warmly welcomed at the Kolkata Airport. Following customs, immigration formalities and baggage collection, our representatives will greet you and welcome you with a floral garland as you exit the Arrivals Terminal following which you will be transferred to your hotel. This morning you will proceed to city tour ‘ The secrets of Kolkata’ to visit the Victoria Memorial, Howrah Bridge, Mother Teressa House, Kali Temple and Botanical Gardens. The East India Company founded the garden in 1787. It was formerly known as the Royal Botanical Garden. It is famous for its huge collection of bamboos, orchids, palms and the plants of screw pine genus. You will be transferred to railway station for overnight train journey to Siliguri. Upon arriving at Siliguri Railway Station our representative will receive and transfer you to Gangtok for Overnight stay. 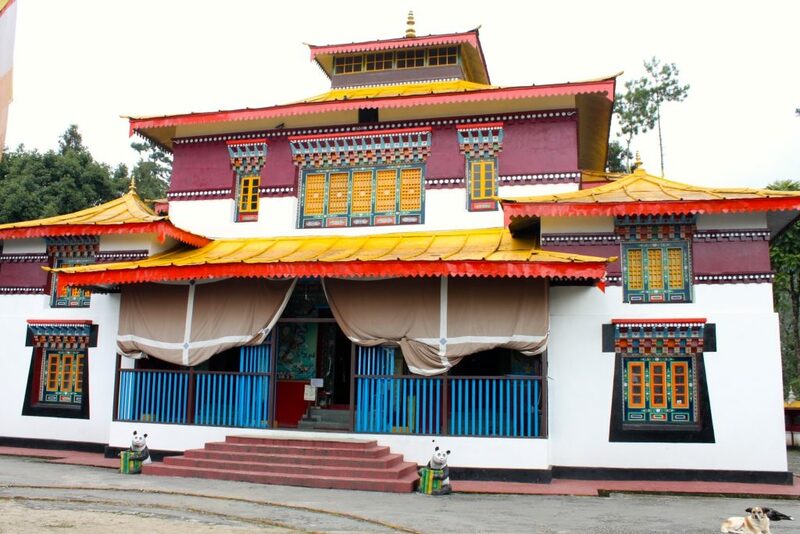 You will have half day local sightseeing in Gangtok . 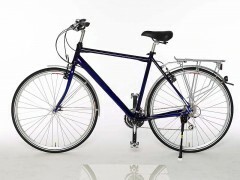 In the evening we have to assemble our bikes and to take them for test ride for nest day’s ride. 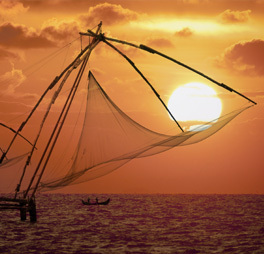 In the evening we will meet at a local restaurant for meal and will have introduction of the tour. We stay overnight at Gangtok. This trail is metal led except between Rakdong and Dikchu. The trail is moderate till Rakdong and then there is downhill to Dikchu. The trail is also moderate till Phedang. On this trail we will stop at Tashi View point from where we can have the panoramic view of Mt Kanchenjunga and its ranges. After the glorious view of Mt Kanchanjunga we will pass through some beautiful Sikkimese villages and will cross the Teesta at Dikchu (an old trading town during the caravan days from Tibet). We will Camp in a Lepcha village at Phedang in Dzongu and will have lunch en-route. We stay overnight in Phedang. Ride will start after breakfast through Lepcha villages and don't be surprised when people turn out in numbers to look at you as this will be their first experience that cyclists are passing through their villages. The trail is gentle till Sankalang After this the there is a steady climb till Mangan, the District Headquarter of North Sikkim which is also known as the ‘Large Cardamom Capital of the world.’ Trail along the right bank of the mighty Teesta River till SAngkalang. 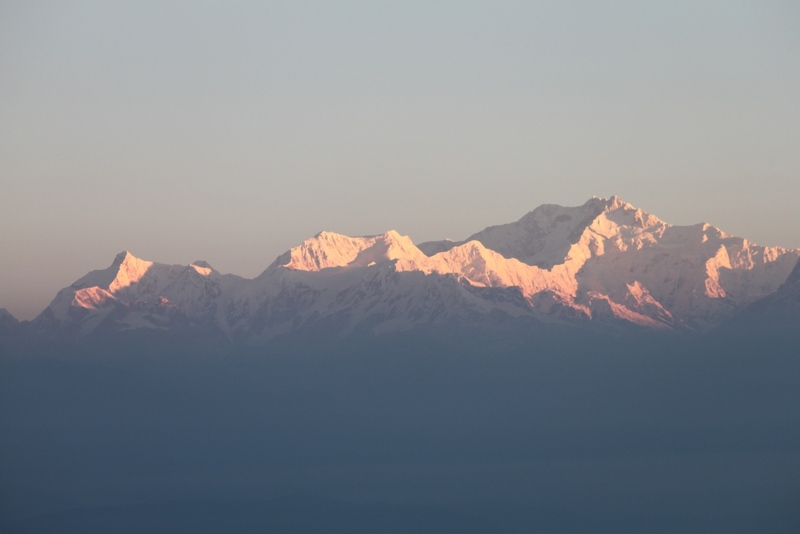 We will be camping at Singhik from where you will get the grandest view of the Kanchenjanga range in the morning. Lunch on the way. The trail is almost metalled. We stay overnight in Singhik. After breakfast we start cycling towards Chungthang and you will find in few places where the monsoon has damage the roads the some of trail is all metaled. It's a gentle ride with few climbs at some places. The way we will be passing through waterfalls and gorges. We make overnight Camping at Chungthang, which is situated at confluence of the two rivers, one the Lachung, and the other is Lachen. It’s a small town and has few shops. We stay overnight in Camp. Today’s trail will be climbing and it is metaled. After trailing about 10 km you will be in the alpine zone where the views of mountains and the cascading waterfalls is just mind blowing. Today we stay overnight in hotel. In the trail there are bits of climbing and turns. The altitude changes from here. The path passes through very beautiful rhododendron forests and meadows of primulas. 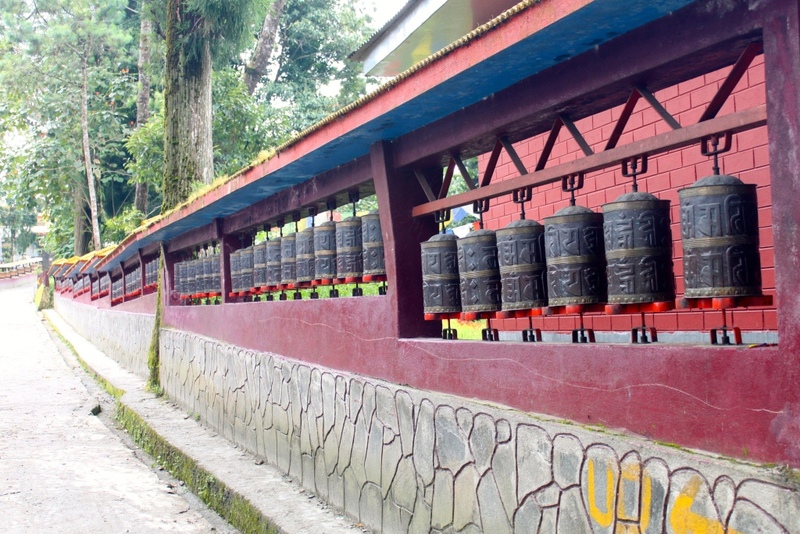 In this route we will find the famous Singba Rhododendron Sanctuary. The Camping will be on the beautiful meadows of Yumthang having spectacular view of the mountains surrounding you. We stay overnight in Camp. Morning beautiful view of Yumthang and later we continue our biking down hill to Chungthang. We make overnight Camping at Chungthang. The route follows along the Lachen Chu river. The trail is metaled and has a gradual climb. This trail passes through thick forest of Magnolia and bamboo. The deep gorges can be seen on the way to Lachen. Lachen means the big pass which is populated by semi-nomadic Bhutia tribe. The village is located between two ancient moraines with Lamo Angdang peak in the backdrop. These villages have about 230 houses. The monastery and the old nunnery are worth seeing. We stay overnight in Lachen. The trail is rough at few places otherwise it is metalled. The altitude gain is quite quick. Beginning of the trail is in narrow valley but as we reach the higher altitude the valleys begin to widen. The Yakthang valley is a picturesque as river flowing through it. The primulas and other Alpine flowers of the Sikkim Himalayas cover the meadows. In the evening walk around the village or go to a local bar for a sip of locally made "Chaang." Having breakfast we proceed to Chopta Valley/Kalapather. Chopta Valley is a huge U shaped valley with the Chopta Chu twisty in between. There are maountains around Thangu which makes the town very beautiful. 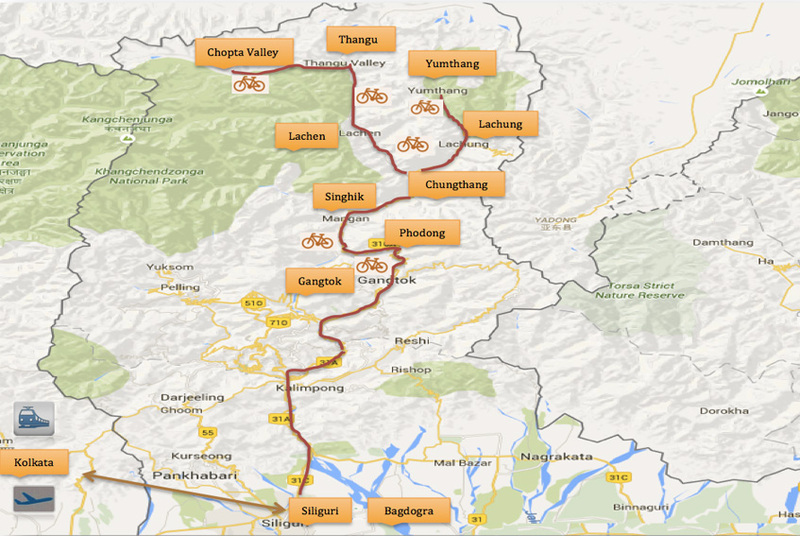 Then ride about 3 km to Kalapather, the base of the Lunakla, a pass to the Muguthang valley, the home of the "Drokpas." We will ride from here to Lachen. Lunch on the way. Today’s ride will be quite long but most of the ride is towards downhill. We will bike up to Chungthang today. We follow the same trail as we had come up till Mangan. At Rangrang you have to cross the high suspension bridge to the Camp site which is beside paddy fields. We will pass through paddy fields and some beautiful Bhutia and subba villages. On the way visit to Phensong and Phodang monasteries. Lunch on the way. Visit to historic site of Kabi – Lungtsok. Here the two tribes, Bhutia and Lepchas signed the brotherhood treaty with their blood taking Mt Kanchenjanga as the witness. Then we will move on to Gangtok. The trail is beautiful and metalled with few rough rides in between. Morning after breakfast start drive 130 Kms to Bagdogra Airport. On arrival at Bagdogra Airport transfer to Airport to board the flight for Kolkata. On arrival at Kolkata Airport our representative will assist you and transfer to hotel. On time our reresentativel will pick you from hotel and transfer you to International Airport to board your flight for onwards destination.